Here's a couple of poems to help you remember how to round! Change the rest of the numbers to zero! 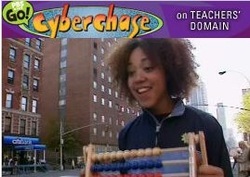 In this video segment from Cyberchase, Bianca has volunteered to help count the number of runners participating in the New York City Marathon. She must keep track of the runners as they pass a certain checkpoint on the course. There are at least 30,000 runners, so she has to develop a good strategy for counting such a large number of people. She tests out a few options, but finds that an abacus may be her best tool. 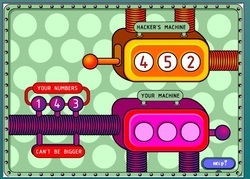 The challenge is to make a number larger than the one on Hacker's machine. Can you do it? What You Will Do: You will use a place-value chart to find the value of each digit in a number. How You Will Use It: You will discover that the value of a digit depends on its place in the number. You will need to print a recording sheet to do this activity.